This recipe is for a chicken-and-potatoes meal, all made in one pot! Let your pressure cooker do all the work, keeping the chicken moist and tender while paring your active cooking time down to nearly nothing. This recipe is especially handy during the warmer months when you'd prefer to not heat the oven and, therefore, your kitchen. Honey and Lemon add a great, bright flavor to the chicken. 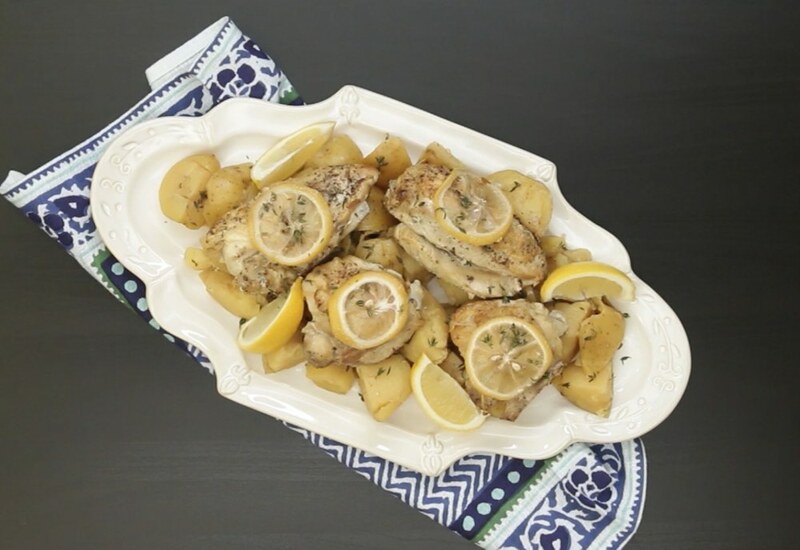 Garlic and thyme help make the potatoes a perfect pairing for the poultry. Great for a weeknight dinner the whole family will devour! Carefully lay chicken pieces skin-side down into the hot oil; cook until browned, 3 to 5 minutes per side. Remove chicken to a plate. Sauté garlic and thyme in the chicken fat until fragrant and lightly golden, about 1 minute. Pour wine into the pot to deglaze, scraping any brown bits of food from the bottom of the pot with a flat-edged utensil. Bring wine to a simmer and cook until slightly reduced in volume, 2 to 3 minutes. Pour stock into the pot; add potatoes and season with salt and pepper. Gently lay steam rack onto potatoes. Place chicken pieces, skin-side up, in your pressure cooker’s steamer basket. Place steamer basket onto rack. Drizzle honey over chicken; top with lemon slices. Select Poultry and cook for 12 minutes on High pressure. Transfer chicken to a platter. Use a slotted spoon to drain the potatoes and arrange around the chicken. Garnish chicken and potatoes with fresh thyme leaves to serve. Want mashed potatoes? Remove the chicken, then return the potatoes to the pressure cooker for 5 more minutes of cooking on High pressure. Per Serving: 530 calories; 19g fat; 45.3g carbohydrates; 40g protein; 136mg cholesterol; 357mg sodium. Add a little oregano and lemon zest for extra flavor! That's what I did and it turned out great. I also used all boneless, skinless chicken breast. It pairs perfectly with a salad or other green vegetable. Delicious, hearty, and full of flavor. I used red potatoes and they turned out great. I served it with fresh sautéed garlicky spinach. I had no idea I could use the steam rack and basket to cook two things at once. I've had my pressure cooker for awhile and used it only a handful of times. Now that I know this trick, I'm going to be using it much more. This is the first recipe I made with my new Multipot! It's quick, super easy to clean (win), and cooks the food to perfection. The meat came out tender and the flavor was spot on. Such a convenient, delicious meal. The chicken was super moist and tender! I didn't use honey but thought the lemon flavors were perfect. The garlic and thyme are a must, I even added extra! I made this recipe with leg quarters and the meat was really tender and juicy. From start to finish this took under 1 hour, which is a win for me. My family loved it, even my picky kids (they never like anything). Glad I found something healthy, quick, and kid friendly. This was my first use of the appliance. In terms of time, I was definitely not disappointed! My only complaint is that the sauté heat was really high and we had a surprising amount of spatter from the pot. The chicken was not very flavorful, but again this could be because of something I did wrong in my first use. Delicious! I used boneless, skinless chicken breasts and seasoned with garlic powder, Italian seasoning and salt and pepper. Used petite gold potatoes since that’s all I had on hand. This was a major crowd pleaser, including my 4 year old! So good, so quick and so easy.